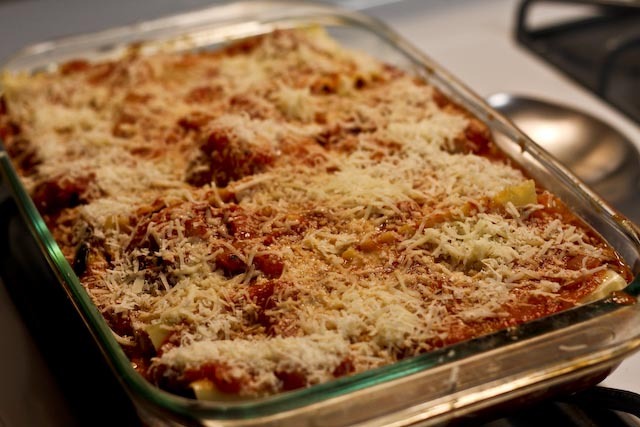 I really like vegetarian lasagna – I think even more than lasagna with a meat sauce. Shh, don’t tell anyone in Bologna that I said that! I don’t know why, I just like it better with veggies. 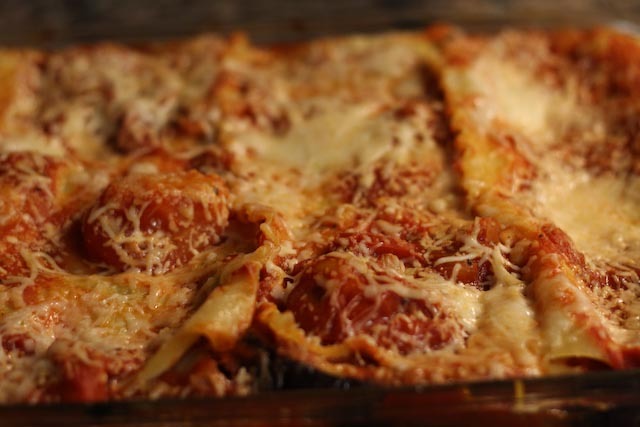 I have never had an eggplant lasagna before, but it just sounded delicious: eggplant (one of my favorite vegetables) plus pasta, sauce and lots of cheese – what’s not to love about that!? For this lasagna, it’s necessary to bake the eggplant first. If you put it in the lasagna raw, it won’t cook thoroughly. 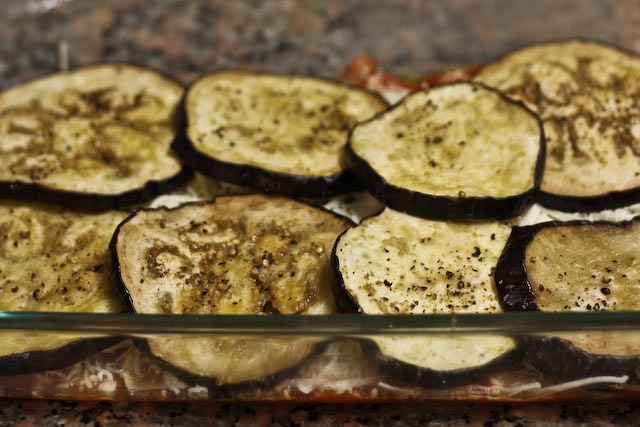 I brushed thick eggplant slices with olive oil, seasoned with salt and pepper, and baked them for about 20 minutes. Apologies, I don’t have many photos to show you of the process for making the tomato sauce. I was sort of in the groove and forgot about my camera sitting there. The good news is that the sauce is super easy to make – and was delicious (probably my favorite part about this dish!) One thing I did – that may seem kind of strange – is I used whole stewed tomatoes in the sauce. They have great flavor and you can break them up a bit with a wooden spoon so that they are more bite-size. I find a trick with lasagna pasta is to cook it for about 4 minutes, just to get it flexible, and then let it cook the rest of the way (about 20 minutes) in the oven. 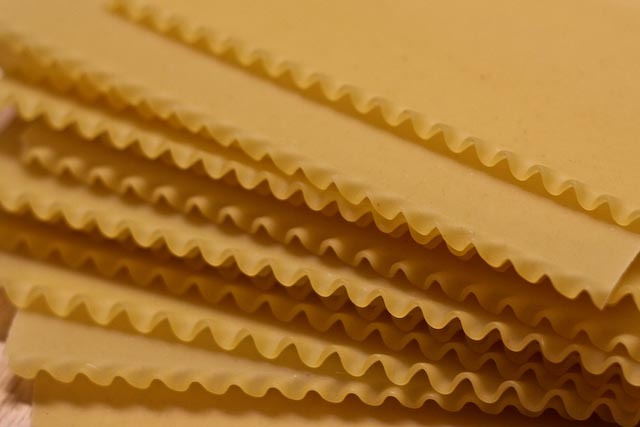 This way you get pliable pasta to work with but you avoid over-cooked, broken down lasagna noodles. 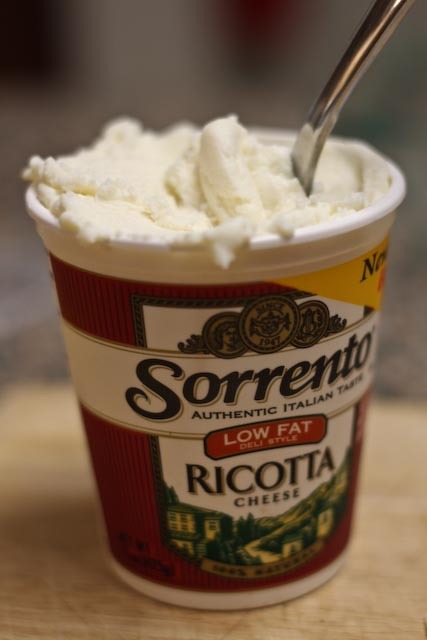 Mmmm, ricotta cheese! I like to use low fat ricotta, but the regular old full-fat kind would do just dandy. Just look at that monster lasagna ready to bake! Let it cool a bit before slicing (so you don’t end up with lasagna sliding everywhere). I served mine with breaded chicken cutlets. Yum! Bring water to boil in a large pot seasoned with salt. Add lasagna noodles and cook for approximately 4 minutes. Drain and set aside. Coat pasta with a bit of olive oil to avoid sticking. In a medium sauce pan drizzled with olive oil and over medium heat, add onion and garlic and cook for about two minutes, stirring often. 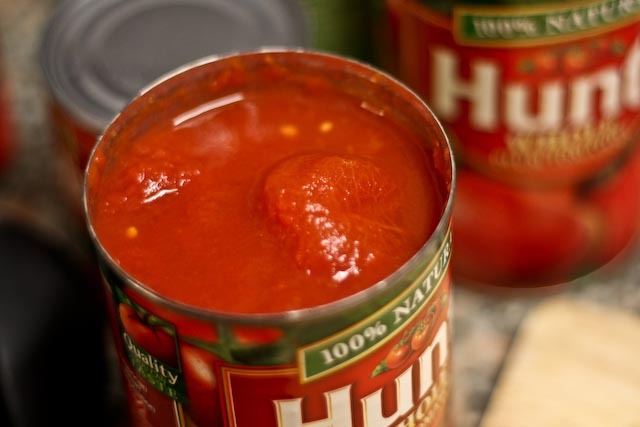 Add cans of tomatoes, tomato sauce and tomato paste. Stir well to combine. Season with salt and pepper and add Italian or other desired spices. Reduce heat to low and let simmer for about 20 minutes, stirring often and using the back of a wooden spoon to break up the chunks of tomato. Remove from heat. Preheat oven to 350°F. 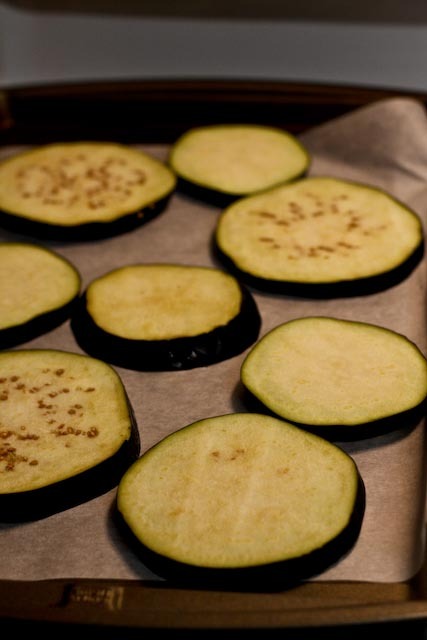 Line one or two large baking sheets with parchment paper and lay the eggplant slices in one layer on the sheets. 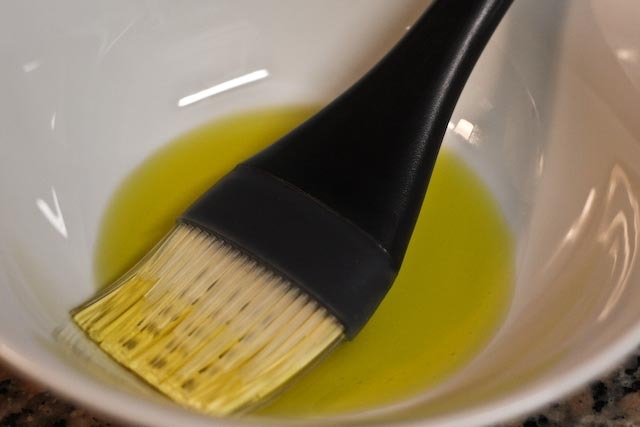 Brush liberally with olive oil and season with salt and pepper. Bake for about 20 minutes, rotating trays half way through baking, until tender. Set aside but leave oven on. Drizzle a large glass or ceramic baking dish with olive oil. Add about 1/3 c of the tomato sauce and spread around the bottom of the pan. Add enough lasagna to cover the bottom of the dish. With a spoon, drop dollops of ricotta cheese (about 1/3 of the container) over the noodles and then sprinkle generously with about 1/2 c mozzarella and 1/3 c Parmesan cheese. Add the eggplant in one layer. Repeat with sauce, pasta, cheeses and eggplant for two more layers. The last layer of pasta should be covered with tomato sauce and additional cheese. Cover with foil and bake for 10 minutes. Remove the foil, rotate the baking dish and bake for an additional 10 minutes until the cheese on top is melted and just bubbling. Allow to cool for about 10 minutes before serving. Serve warm. 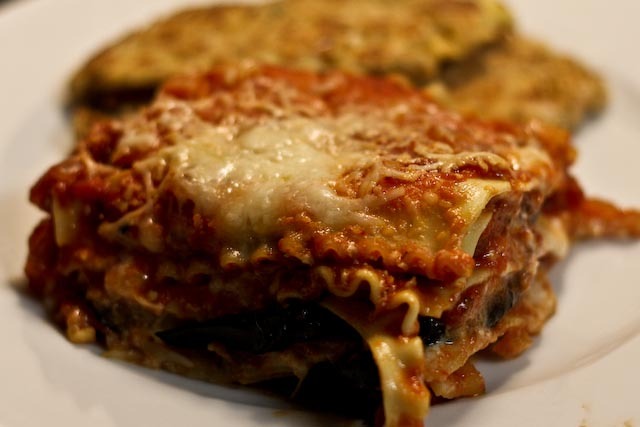 We love eggplant and make our own version of eggplant lasagna. We were even talking about it tonight. Instead of rounds, we slice it lengthwise and layer it like lasagna noodles. You can also do the same thing with zucchini. Your recipe sounds delish! That sounds delicious! Do you skip the noodles then and just layer with eggplant or zucchini? Yes. The eggplant and zucchini take the place of the noodles. Slice them lengthwise and place them raw in the dish as the noodles. 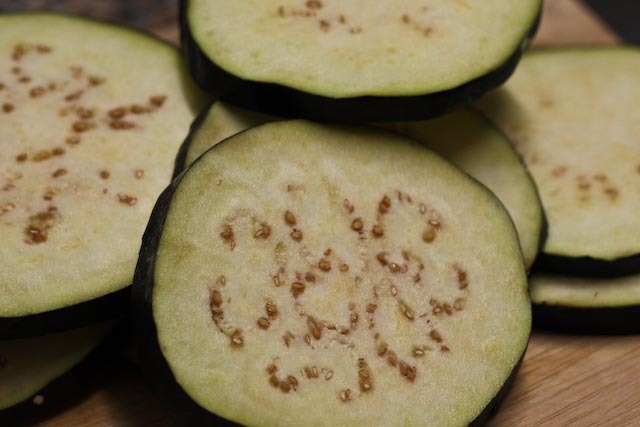 I prefer using zucchini because it has a little more body to it that the eggplant when cooked.